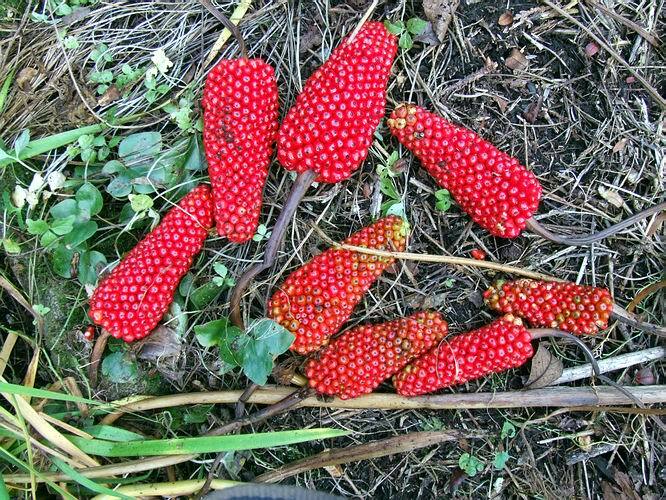 These Arisaema ciliatum fruits have become a regular image in the autumn bulb logs but each year more appear. The size and number of seeds per head seen here is because of the cool moist summer we had, allowing the plants to grow on longer than they do in years when it gets a bit dry and then they retreat into an early dormancy. Unlike the early spring bulbs which were forced into early dormancy by our unseasonably hot April the summer growing bulbs have fared very well this year. 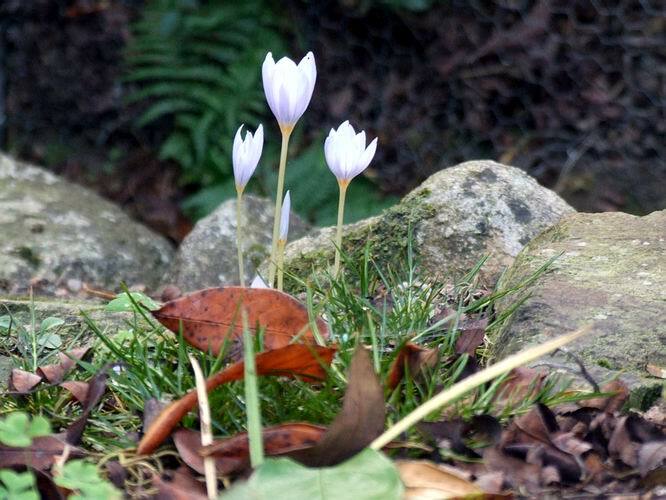 Many of our Crocus, like this group of Crocus medius, suffered from this years early dormancy and while there are plenty corms there are not so many flowers as I would normally expect. Many of them have made lots of smaller corms in place of one or two flowering sized corms so my prediction is that in two years these small corms should reach flowering size and we should then see a bumper flowering season of both the autumn and spring crocus. 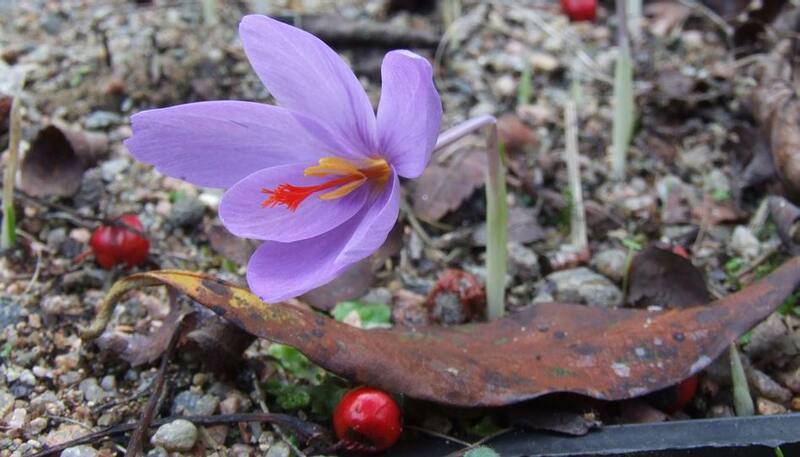 Crocus medius has this wonderful colour combination between the brilliant scarlet style and the lavender petals - looking very seasonal here with a few fallen berries and an autumn leaf. 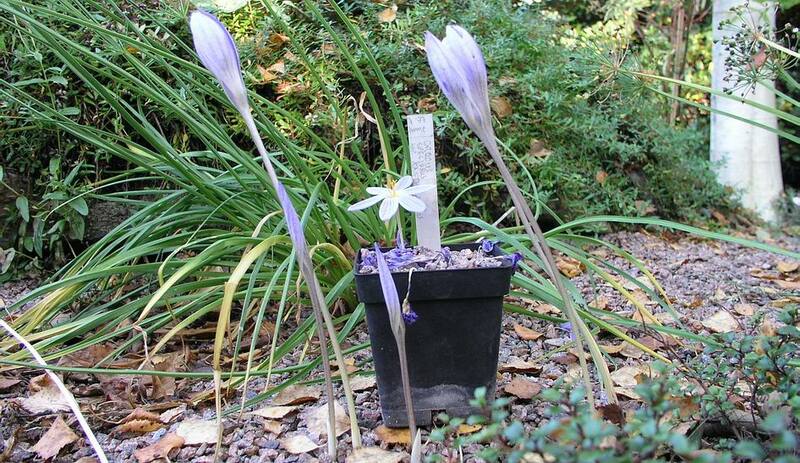 These giant Crocus speciosus in the garden are very susceptible to wind damage being so tall - just compare them beside this pot of Crocus speciosus ssp xantholaimos raised from seed. These larger forms have been selected over many years, mostly by the Dutch and are the ones you are likely to see offered as corms in garden centres. Seedlings from these plants come similar in size to the parent while many of wild origin have neat flowers on a much shorter tube like the one in the pot. As I continue my walk I look in to the seed frame area and see a task awaiting urgent attention. Liverwort on seed pots is a continuous problem and the only answer is to keep it to a minimum and not to let it get a hold - unfortunately I have left it a bit too long. The good news is that with bulbous seedlings which are all under ground at this time of year, it is easy to just remove the top dressing complete with offending liverwort and top dress with new gravel. 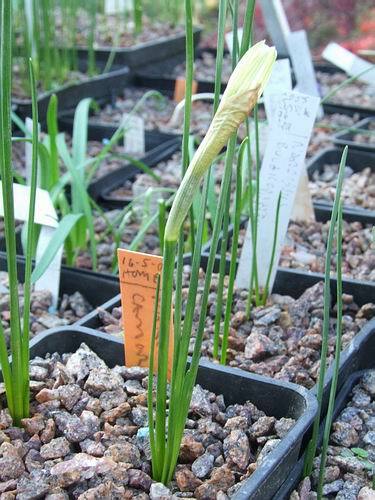 Back inside the bulb house here is the Narcissus 'Camoro' seedling that I showed last week just to show you its growth in the week - at this rate next week I will be showing it in flower. The bright sunny weather has really brought the crocus flowers out and while, as I explained earlier, there are not so many flowers as I would like I am still spending hours just looking at them. Taking in the lovely scent and watching all the bees and hover flies feeding on the pollen and helping me pollinate the flowers at the same time. 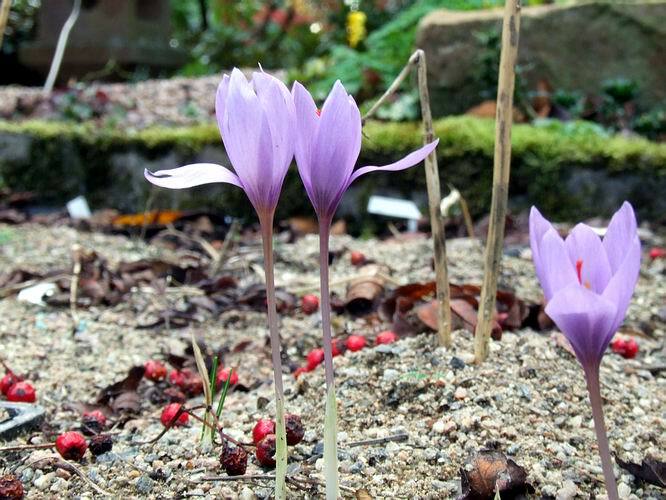 Two flowers on a pot of Crocus kotschyanus kotschyanus seedlings raised from seed that I received from Tony Goode in November 2004 and here flowering for the first time. Just look at the variation there is with just two flowers - I do expect several more from this pot of seedlings. Compare that to this pot worked up in numbers by growing on the cormlets and so it is a single clone. 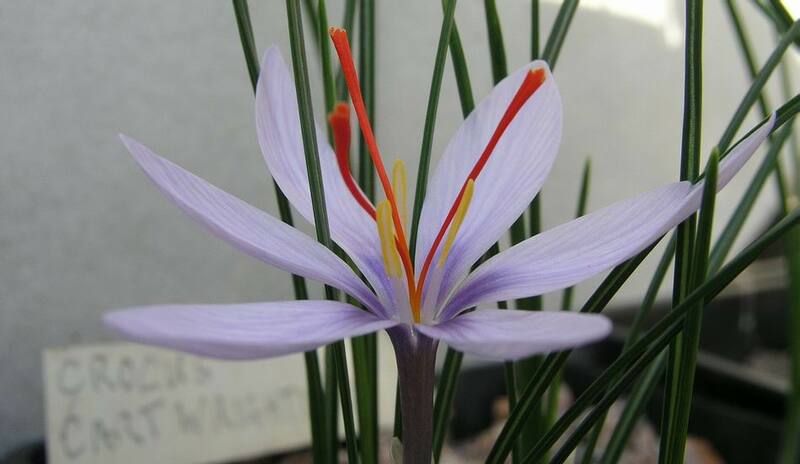 Crocus ochroleucus is a close relative of C. kotschyanus from Syria, Lebanon and Northern Israel. In its type form it has yellow centred flowers with a yellow style but this is a pure albino form with a white style and no yellow centre. 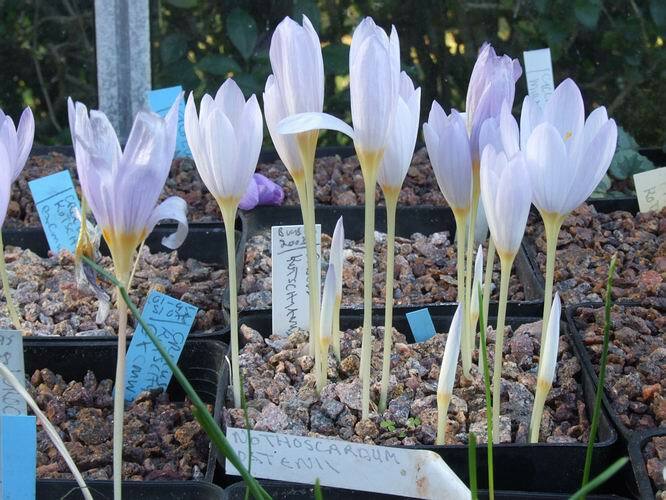 Here is another seed raised pot; this one is Crocus serotinus salzmanii and even though the variation between the flowers is slight it is nice to see and a good mix is always better in my mind than only having a single clone. As well as colour difference there is also some variation in the way the style branches. Mixed clones not only look different they will also have different tolerances to growing conditions and diseases - that is very desirable in a collection. 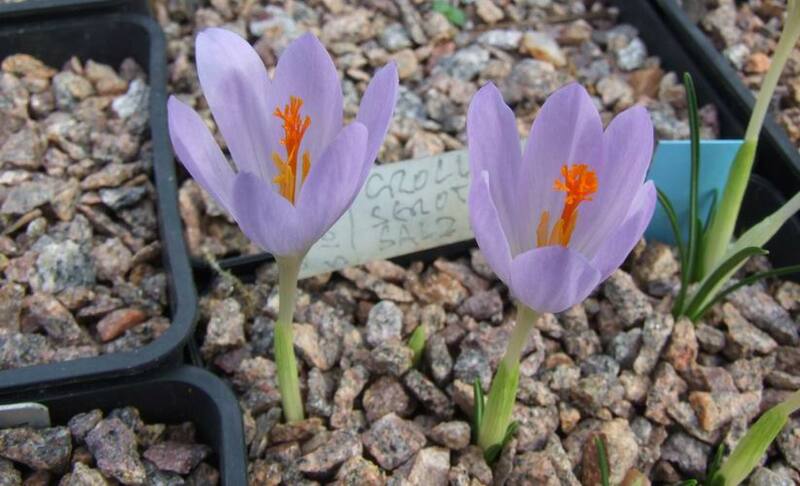 One of the longest styles found in any crocus is that of Crocus cartwrightianus. 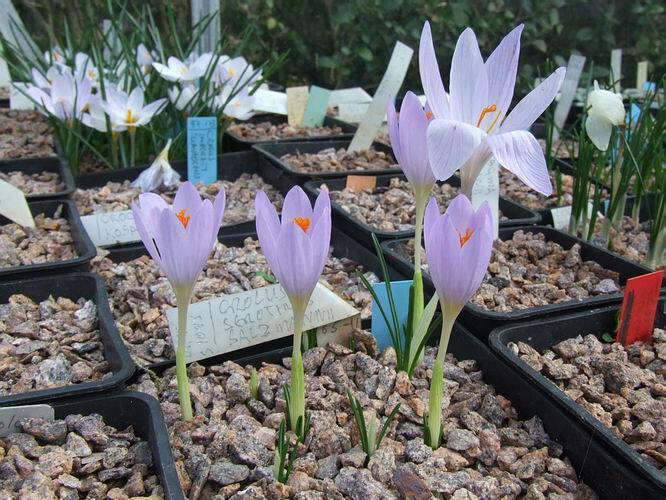 I can flower Crocus cartwrightianus on a regular basis unlike C. sativus, the saffron crocus, which I struggle to flower most years. 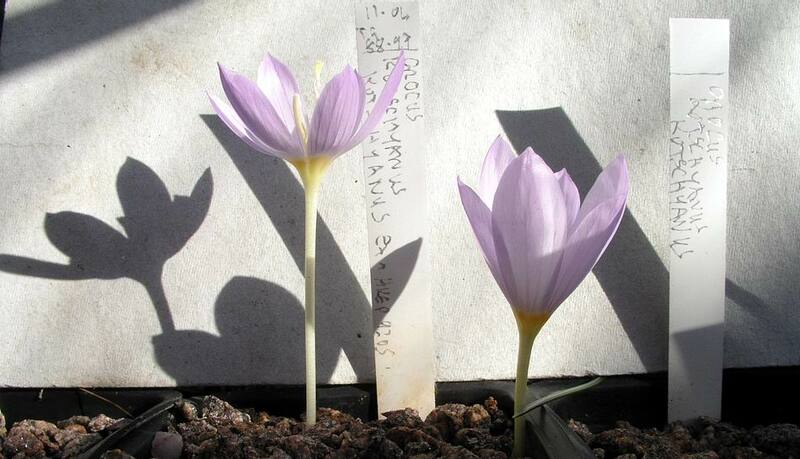 Crocus sativus is unknown in the wild and has been for hundreds of years but it has been in cultivation for thousands of years, grown for the bright orange style branches that are much valued as a spice. Through the millennia that it has been grown wars have been fought over it, fortunes made from it and people were even put to death for adulterating the valuable saffron crop. 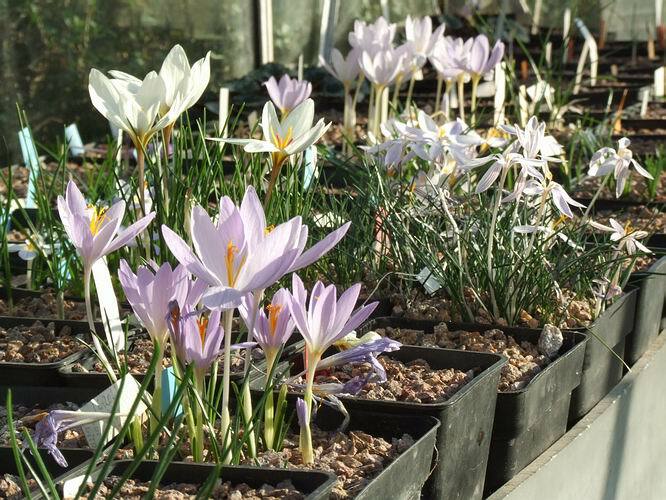 The current thinking is that Crocus sativus is just an extreme form with extra large style branches selected from Crocus cartwrightianus and because it never sets seeds it has been grown clonally for thousands of years making it a remarkable survivor. The more I try and work out what the real Sternbergia sicula is, the deeper I seem to get into confusion. 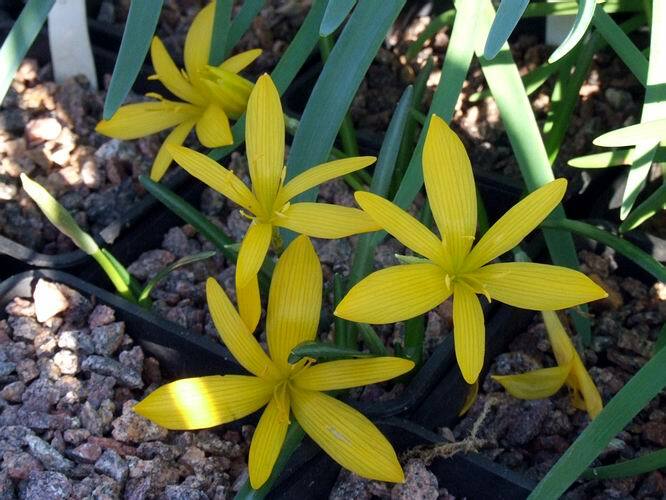 I have been collecting as many so-called Sternbergia sicula as I can get and there are many variations around. 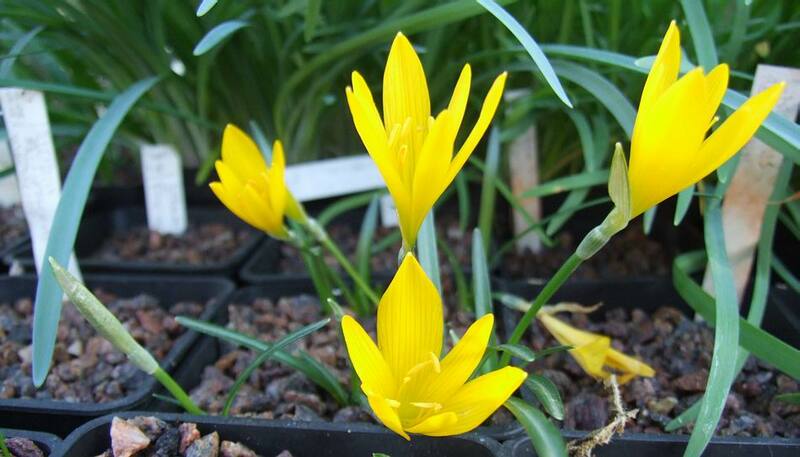 Most seem to be close to what is called Sternbergia lutea angustifolia because they have upright narrow leaves rather than prostrate leaves which S. sicula is supposed to have. I am now wondering if what we have in cultivation is a hybrid swarm between S. lutea and sicula - it is possible that a third Sternbergia species could be involved. I would love to spend some time looking at them in the wild to see if this confusion also occurs naturally or if it is just in cultivation that we find it. What ever the nomenclature I think they are all beautiful flowers, bringing us a colour of yellow that is not found in the wealth of autumn crocuses that we have out just now.